Disclaimer : This is not a book review, it’s just some reflections. I listen to books (via Audible – get on it!) and I listen to them at 1.5 speed (if the narrator’s pace allows). I can’t highlight or underline and, as I’m usually driving while listening, I don’t get to take notes. I listen for big ideas, not details. I listen for concepts rather than quotes. So here are some reflections on a book I recently finished. Creativity Inc. Overcoming the unseen forces that stand in the way of true inspiration. Ed is co-founder of Pixar Animation Studios and president of Pixar Animation and Disney Animation. A computer scientist by training, he initially created software to assist in computer animation but went on to co-found Pixar Animation Studios and create some of our best known and loved animated movies. This book was fascinating. As a lover of animated movies (particularly Disney & Pixar) I was intrigued to get a behind-the-scenes look at all the processes and decisions that go into the making of the movies whose quotes make up around 50% of my general daily dialogue! It’s quite a long read but it has so much in it. Beyond the intricate insights into how characters, plots and contexts were researched, created and refined I was intrigued by the leadership lessons learned and shared. And particularly challenged and inspired about how intentionally they focused on creating, communicating and maintaining a vibrant, creative and productive culture. Easy is not the goal. Disney & Pixar exist to make excellent movies. The book references the thousands of decisions that are made, the distractions that need to be avoided, the challenges that need to be overcome and the budgets that need to be managed in order to make an excellent movie … and then to make another one. Every system and process is painstakingly analysed to refine speed and quality of production, staff satisfaction and overall outcomes. But Catmull was keen to point out that in amongst all of that, ‘easy’ must never be the goal. Sure, the easiest way to accomplish a goal is the goal but the goal is never about ease. He warned about how allowing a culture to be shaped around shortcuts, quick fixes and ‘that will do’ is toxic first to excellent outcomes, but ultimately to team morale and momentum. He gave multiple examples of how high calibre workers are motivated by the challenge to create outcomes of significance not mediocrity (however that might be measured in a given field of endeavour). I loved thinking about how that might translate into other leadership and team environments. I resonated profoundly with this idea. A culture of feedback is essential. Catmull details the processes of feedback employed at Disney & Pixar and they are elaborate. Organisationally, they continually spend a great deal of resource (man-hours, money, energy) on extracting, collating and responding to feedback on all aspects of their film creation. The level of humility demonstrated by senior leadership sets the tone for this. And the intentionality around establishing and maintaining a culture where feedback is genuinely welcomed and valued is incredibly high. A loose paraphrase of a quote – “You don’t want to be in an organisation where the level of candour is higher in the corridors than it is in your meetings. In rooms where ideas, policy and best practice are being hashed out you want to only be hearing the truth – the whole truth.” And he goes on to articulate how it is that they monitored and responded to this. He shares not only his repulsion at the idea that people might withhold their honest opinions because they want to appear amiable to their up-lines, but the acknowledgement that they could never be their best or do their best if these honest opinions weren’t being heard. So they went about developing clearly communicated and curated methods for extracting feedback at every level of their organisation. Sections of this book read as a master class in how to create and nurture a culture of feedback. I suspect I’ll be revisiting it for this purpose. It’s crazy inspiring. Feeding into the value and success of a culture of feedback is communicating (in word and deed) that there is a way for failure to be processed and recovered from – a way back. In fact, Catmull asserts that failure is to be expected because it’s a “necessary consequence of trying something new”. An organisation can’t be hoping for innovation and progress without giving permission to experiment – which innately opens up the potential for failure as risks are taken. Healthy team culture deals with failure in predictable, articulated and honouring ways so as to re-embolden a team member (and those watching on) for continued creative endeavours. What TRUST really looks like. I thoroughly appreciated the repeated references Catmull made to the importance of trust – but also how he defined it. He asserts the necessity of trust for healthy team culture, releasing the creative and innovative, and ultimately for generating best outcomes. Further to his observations on failure, he posits that performance failure can’t be a reason to withdraw trust. “Trust doesn’t depend on a person not messing up – it means that you’ll keep trusting them even when they do mess up!” (paraphrase). Trust is about trusting the motive and intent of a person – they were thinking this would help and achieve what we were hoping to achieve, it just didn’t work out that way. Rather than assuming the worst of a person – they wasted time and money on a method that was useless and now they can’t be trusted with that level of autonomy or creativity again. If failure is a necessary consequence of trying something new and you want your people to try new things then they can’t be penalised if that attempt wasn’t successful. Trust gives a person confidence to make their best effort and offer their best ideas knowing that you are behind them and for them and will help them find their way back if things go wrong. There’s more. You might want to read it yourself. If you’re keen on learning more about developing great organisational culture – this book could be for you. If you’re particularly fond of Buzz & Woody and all their other mates, then you’ll love it too! Kids Ministry is an exciting and exhausting place to serve. Those who do it well will absolutely love it and give their all to it – but that doesn’t mean they are immune to feelings of doubt or fatigue. 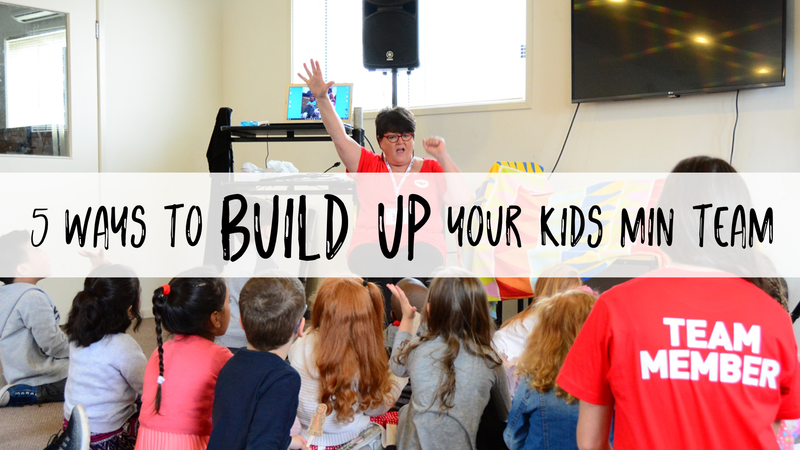 Here are 5 very simple yet super effective ways you can make your Kids Min Team better – building them up in their sense of purpose and energy to continue to invest in our kids and community. Give them a high five at sign in. Tell them you appreciate their commitment to your children. Help them understand the impact their serving has on you and your family. Remind them of the important part they play in your church community. Drop them a note, give them a FaceBook shout out, or speak it out loud. Make the effort to learn and remember their names. Get to know them. Find out what year they’re doing at school, what they’re studying at Uni or where they work. Try and discover what they do for fun, what their favourite chocolate is, what music they listen to or what sport they follow. Your effort will communicate such high value to them. Because Sunday mornings are hard y’all!! Surprise them with coffee or breakfast donuts and fruit. Buy the night team a pizza for supper or bring slurpees on a hot day. When your kids remember something they learned at Kids Min or when they tell a story about something their leader did – pass it on. Help them understand how their influence reaches beyond the scheduled ministry times. Encourage them to know the impact they are having in your kids’ lives. Join the team – Kids Min teams ALWAYS need more members – and multiply their ministry effectiveness by adding your own gifts and skills. If you can’t be part of the scheduled ministry times, find ways to serve from home or during the week. PICK ONE (or more) – and do it NOW!